Banks Board Bureau is the first ingenuity towards a holding company structure for public sector banks (PSBs). BBB is an autonomous body of Union Government of India tasked to improve the governance of Public Sector Banks, recommend selection of chiefs of government-owned banks and financial institutions and to help banks in developing strategies and capital raising plans. It is situated at RBI’s Central Office in Mumbai. 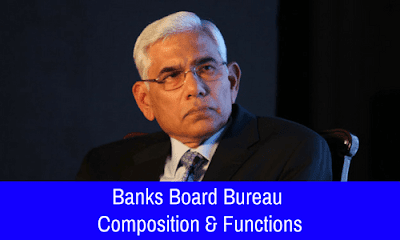 The chairman of Bank Board Bureau is Mr. Vinod Rai. He was the 11th Comptroller and Auditor General of India and is known for Audits on 2G spectrum allocation, Coal allocation. The bureau was announced as part of the seven-point Indradhanush plan to revamp public sector banks. BBB have three ex-officio members (government) and three expert members, two of which are from the private sector, in addition to Chairman. The tenure of Rai and other members of the board are of two years. It is interesting to note that all the Members and Chairman are part time. BBB is not funded from the Consolidated Fund of India. This step of forming BBB is seen as an interim step towards establishing a holding and investment Company for Banks, an idea first mooted at the maiden banking conclave Gyan Sangam. The Bureau will recommend for selection of heads - Public Sector Banks and Financial Institutions and help Banks in developing strategies and capital raising plans. The Bureau helps Banks in developing strategies and capital raising plans through innovative financial methods and instruments. BBB also advises banks on strategies for consolidation among them including mergers and acquisitions. It also infuses efficiency and transparency in the Banking sector. Once it develops credibility, it can start viewing into the strategies of various banks and can give guidance to banks if they require. BBB will also be a link between the government and banks, and will work together with banks in developing strategies for them. Through this government is trying to professionalise the management of public sector banks. Banks Board Bureau has been set up at a time when state-run banks are besieged with high levels of bad debt and huge losses on account of higher provisioning. The non-performing assets of public sector banks are estimated at almost Rs. 4 lakh crore, and they need to raise capital of Rs. 2.4 lakh crore by 2018 to conform to Basel-III capital requirement norms, according to the government. Therefore BBB will have to be very careful while appointing people. Well experienced people who have adverse knowledge of banking sector will be required to head the banks for effective working of the board.